Airports are my favourite. There is nothing to do but sit, think, eat hamburgers, and spray myself with expensive perfumes. Whatever is left behind is simply that, left behind. The frantic rush of preparations is over and all that remains is the journey. I am, however, always surprised by how nostalgia seems to creep in, from the moment I step into the taxi and hear the vallenato to the fantastically priced arequipe and sombreros vuelteados on display in the gift shops. Or perhaps is the aroma of coffee wafting out of my backpack, full of gifts. Whatever the case, I start to reflect on what my life has become in the spaces between the airports. About every two years, I write a blog post from the airport. I did not imagine as I wrote that first ever airport blog that I would still be blogging, and secondly, that I would still be writing from Colombia. In fact, there were many things I could never have imagined: riding in a van full of escaping snapping turtles in the middle of the night; watching as Jhonatan walked out of prison; taking part in the peacebuilding Olympics. When I arrived on that first airplane journey, I only wanted to stay for two years. I had not lived in a permanent place for over a decade and after I was finished in Colombia, all I wanted was to move somewhere and live deeply in one place. Yet, here I am, still trying to sink down roots, only this time in a place that I still believe to be a temporary layover. What if the very fact that I love airports means that I destined to forever be a traveler? People in Melbourne write emails to trees. The city assigned each tree an email and an ID number so people could report hazards, such as falling branches. Instead of simply reporting damages, those in the city started to correspond with their trees, writing love letters or simply a note to say hello. Part of being human is seeking connection. 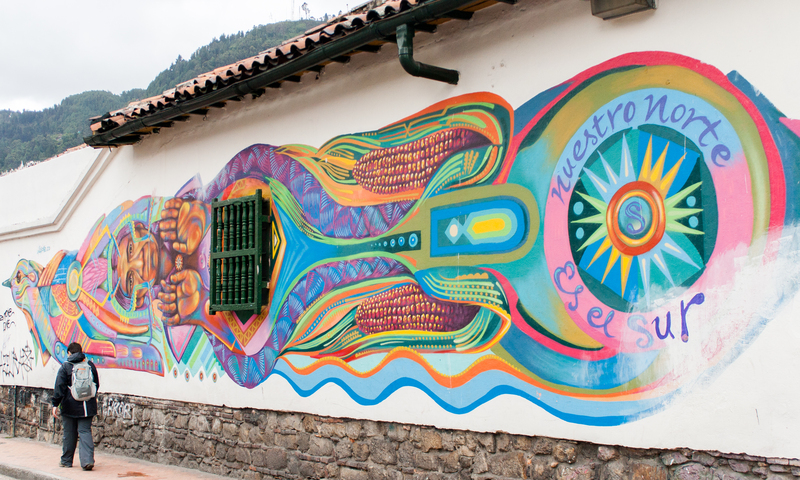 In June and early July, I went on a graffiti tour around Bogota’s old city centre and also to the tiny countryside community of Guatavita. On city walls and street corners, graffiti artist spray and stencil public visions of a different community, one where seeds are sacred, flowers sprout from guns, less is more, and people, not companies, run the country. In Guatavita, as our tour guide led us around the ancient lake, he told us the real story of the legend of El Dorado: how Spaniards and later the British had enslaved his people and forced them to dig a road through the mountain and dredge the lake of its sacred gold ritual items. Despite everything, he pointed out, the earth itself was slowly closing the gap ripped open by colonization, as rocks fell together and even the mountain seemed to be moving in on itself. I could tell you that I am still here because of a global solidarity, the search for justice, and a specific vocational call and these may hold some truth. Yet when I am honest, I think I a m finally learning how to pay attention. And I am astonished: that the world is so beautiful; that people write letters to trees; that spray paint speaks to the heart. All I want to do is tell you about it. In a constant cycle of layovers and gate changes, this is my journey so far. Thank you for writing this. 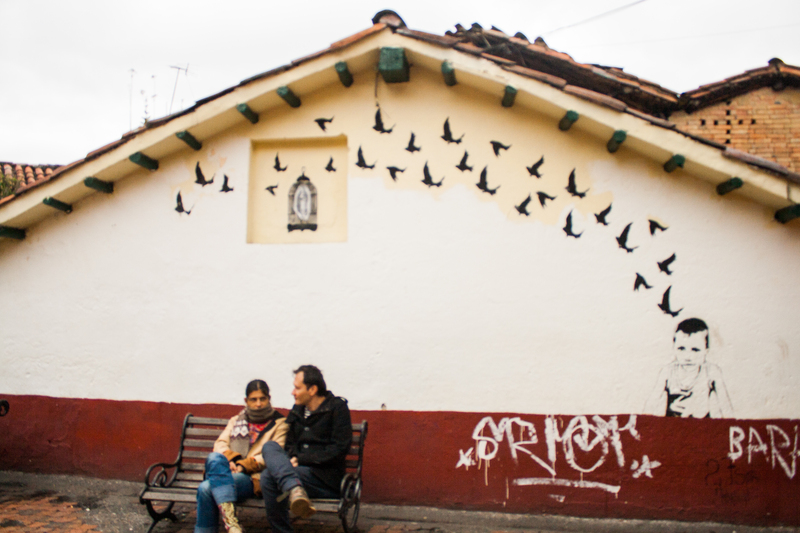 I love Bogota’;I feel nostalgic for vallenato (although I don’t really like it or what is represents), I miss the layers of graffiti by toxicomano and others, and the posters and the history. I chose to leave in the end, for the second time, but will remain a rollo in exile. This was nice, thank you. I searched “airport nostalgia” and found this entry. My airport nostalgia is different from yours, more that it makes me remember an easier time with less responsibility. And arcade machines! Thanks for the comment, Jared!